On my original spring shopping list, I had a pair of dressy track type pants. It's when I stopped looking, that I found my pair. They are from Ricki's and are super comfortable. I really like the length and how that leg line gets extended when wearing my black ankle strap suede and calf hair pumps. Those trousers are in pics #1 - #6. These are very quick stylings (I'm between getting home from work and making dinner) and not entirely sure they work exactly but hopefully you get the idea. They are 100% polyester but not like "old school" polyester - they feel more like silk and actually breathe quite nicely. In fact, it needs to warm up before I wear these outdoors. 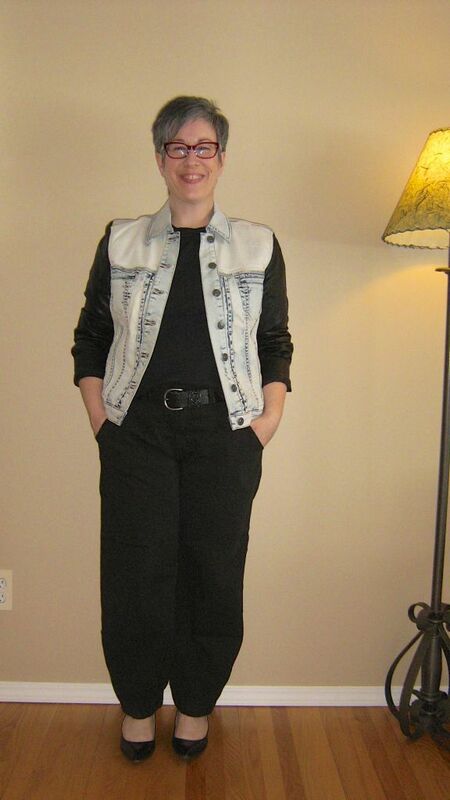 Pics #7-14 are the J Brand Earhart aviator trousers I stalked on eBay. They are technically a cropped pant but not on short me. But you know what? I don't care! This twill blend fabric is so lightweight and soft, it's like wearing pyjamas. The fit is slouchy but not overly so IMHO. The legs are definitely wide and have a harem-like feel to them, but that's kind of what I like about them. Again, these are some very quick stylings. I've tried a roll on the bottom for other options but would have to add a pin on the inside as the zipper wants to pull the roll down and make it too bulky. So try and visualize the trousers with a flatter roll. Just when I posted recently about not liking volume on my bottom half, look what I bought? But I figured out I really like the dressy pair because they taper at the ankle and are sleeker. And I like the casual J Brand Earhart's because they have a cool kind of vibe to them that somehow compensates for the extra volume. 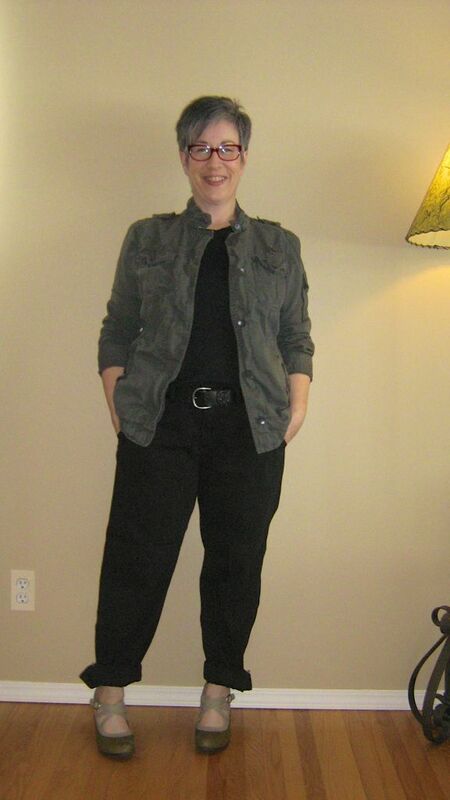 ETA: I just realized I have my hands in my pockets for all the Earhart outfit pics - I have no idea why! Also forgot to mention that I'll be stitching down the slant pockets on the first pair so the side lays flat. Truly, polyester these says can be better than silk. It blows me away. I do not need convincing about the fabness of polyester. High five. Love the J Brand Aviators sans the roll. Petite has worked in your favour. Super, super modern and hip. I think we are borderline on the length with the track pants - you are asking Queen Pedantic About Lengths - so bear that in mind, sweet Shannon. How about a black heel or flat to further elongate the line? Love them though. Okay. I'm going to be Big Bossy Angie. These are voluminous trousers compared to the structured integrity you've been loving this year. May I suggest trialing them at home a little longer. You could wake up tomorrow - pop them on - and loathe them. So don't be too hasty with the keep, despite the forum love. You have got yourself a deal Angie! I can wear the track pants with my black pointy toe kitten heels and the black Okala's if they work in my feet. That would help, yes? Aren't the Earhart's fab? Without the roll is better, I agree. And hubby loves them. I forgot to mention that the track pants are cropped to begin with so that's why the length is a bit odd. I have to smile at all those photos of you with your hands in pockets. When I wear my slouchy black trousers I do exactly the same thing! They just seem meant to be worn that way. :) It puts the insouciance into slouch! Shannon, is there any seam allowance to let the first pants down? I suspect not because of the zippered sides, right? But Angie's right -- with a black shoe, pointed, they will work -- I love the taper. I also prefer the J. Brands unrolled. The roll looks a bit untidy to my eye and interferes with the look of the footwear. But I love the pants! 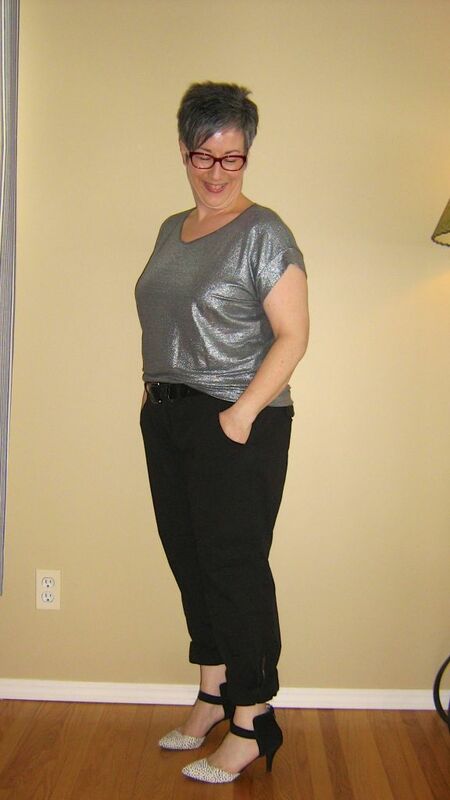 Suz - the silky track pants are actually cropped length and have a cuff, which could possibly be let down. Hmmmm...I actually liked the length and thought it was working as per Angie's cropped pants with ankle strap formula. So it seems they either need to be shortened or lengthened? These ones don't have the zippers, it's the J Brand trousers that have zippers at the ankles. Peri, I'll bet Shannon wishes that, too. Who wouldn't want to be your BFF? Ah, okay - my mistake re the zippers. 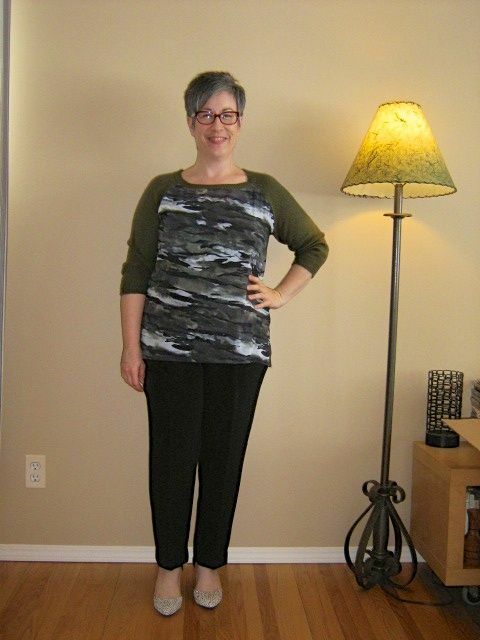 I got confused with all the slouchy black pants I was seeing! I think Angie wore her pants to show the ankle strap and a sliver of skin....or else you want to wear them like regular pants. I think a pic of the side view of the track pants would be helpful to see if they should be lengthened/shortened. The J. Brand's are also fab - unrolled is better. I like Angie's idea to sleep on it and don't decide right away. She's very wise, that Angie! Shannon - agree with all, adore the J Brands but unrolled. I like the track pants a lot. I do think changing out the footwear will make them perfect!! Enjoy!! I feel like I'm always the wet blanket, but I echo Angie's thoughts... Although I personally love this look, and love ON YOU, I feel like you just recently expressed discomfort with volume on the bottom. And this is quite a bit of volume, especially the second pair. I want those j. brands! 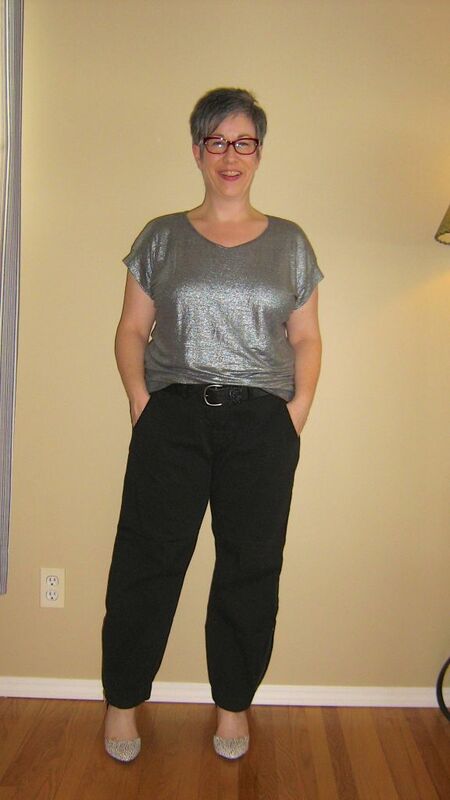 I often try pants that are meant to be cropped, as my regular length is most people's cropped length. Sometimes it works, but more often it's just a leeeetle off somehow, enough that (thanks to Angie) I now can't tolerate it. Suz - you are correct about the sliver of skin. I forgot about that. Karie - yes, a side view will be crucial for making the hem length decision. I'll also need to try the trousers with different footwear. Una - you are NOT a wet blanket. I know the J Brands are very voluminous. 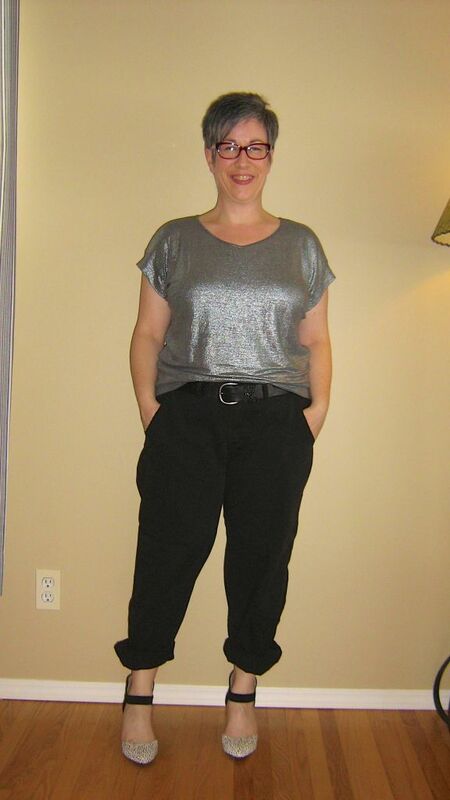 I don't feel the silky pants are as much thanks to the taper and it is hard to tell but the amount of fabric is considerably less than the J Brand trousers. 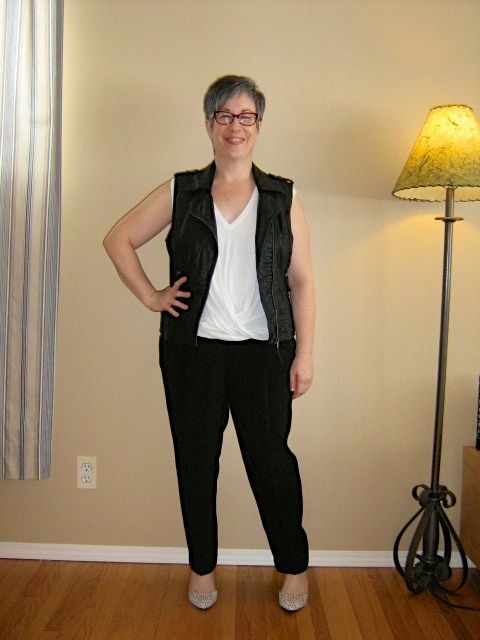 Now to the J Brands - when I first tried them on I was like "yeah, I don't think so" but the more things I tried them on with, the more I liked them. I honestly cannot explain why I don't like the wide legged grey trousers I have but do like these. But I totally understand the suggestion to be cautious and I appreciate all and every opinion. I won't rush, I promise. Funny enough, I could probably get away with the J Brands at the office if I wore them with heels, a tucked dressy tank and a nice topper. Hmmm.... You know, I'm in the market for a pair of black track pants to complement the ones made last spring --- mine have a bit too much calf-sucking taper at the ankle, which is a shame since, after all, I was the one doing the cutting! Now, I love me a wide leg. It's a silhouette that works for me, with my average height. I do find, however, that the ubiquitous "ladies work trouser," or what I call the "TV lady detective" trouser, leaves me cold these days. It feels like someone else's old uniform. A drapey pant, however, with real flow? Now that to me feels fresh and new. 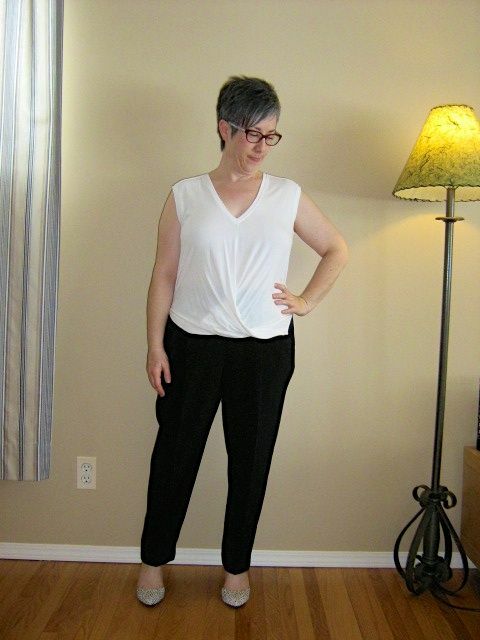 I like both wide and tapered hems, but no palazzos! For your shape, I think the taper makes volume work much better. I love both of these on you. They are quite flattering. Angie has a point about giving some thought to how these fit in your style direction. Perhaps keeping one pair would be a compromise option? Not that I ever compromise. Like, .....ever. Well I am glad wise minds have gotten to you first because I would just screech keeeeeeep without a second thought. I just love your off the cuff stylings too! I love those J Brands - and they look great on you! I'm not in love with the black track pants - I think that they need to be either lengthened or shortened, KWIM? Also, perhaps its because they are black and so the details don't show up very well in pics, but I don't think of these as track pants? - but, maybe I don't really know what track pants are????? What is it about these that makes them track pants? Is there any way you can wear the first pair a bit lower on the waist? That way they might have that tiny bit of extra length. I did notice they looked just a hair short, but pants lengths are so confusing these days! I really like them on you. I agree on the first pair with others. It needs to be shortened a tab bit I suspect. Bit I love the fit on you. And I am speaking to you from space because you have launched me right up there with your cool Earharts!! You rock them Shannon!!!!! So so modern and chic! 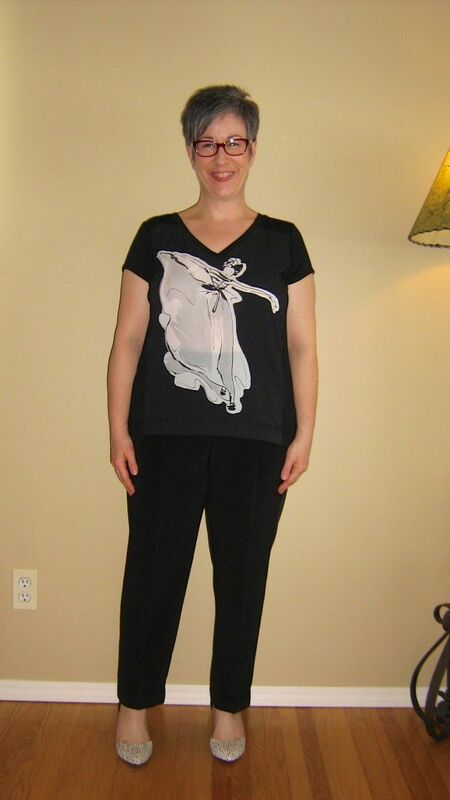 I am still searching for my perfect slouchy black pants like yours. This is not the same kind of volume like your gray pants Shannon. These taper at the bottom. Exactly my kind of SSS! Rock on! I am really partial to the aviators. Also, you have a great collection of graphic tees! 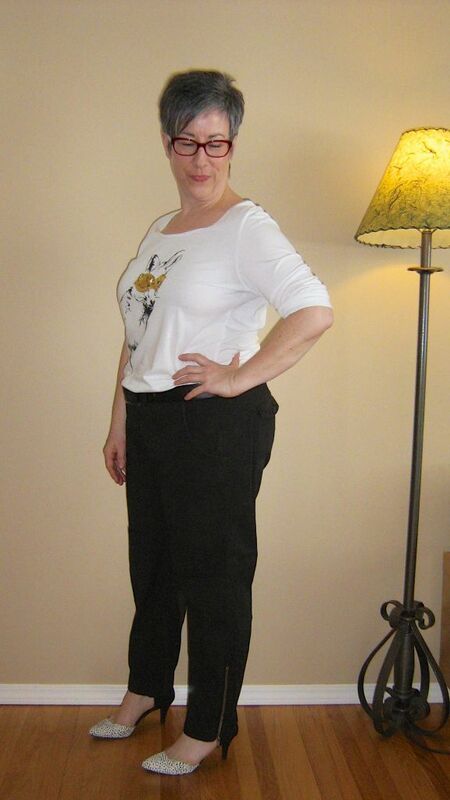 Beth Ann - I think that's exactly it - the taper is what helps a slouchy or voluminous pair of trousers more attractive to me. The volume needs to be reined in. Shevia - you're too adorable! And how did I know you might like these trousers??? Marley - you are totally correct in that the first pair aren't really silky track pants. I wasn't really sure what to call them. I guess they are just silky, slouchy, cropped trousers. Denise - after reading your comment last night about wearing the first pair lower on the waist, I gave it a go and it does help a fair bit. Will try and post updated pics on the weekend when I have time. Rachy - I'm kinda digging graphic tees lately. They add a bit of personality to an outfit, you know? UPDATE: Sooooooo after a night of sleep and clarity of thought, I am leaning HEAVILY towards keeping both of these trousers. I think they are different enough to be worn for different occasions (and different audiences). I like the fit of both and for some reason, do not find the volume overwhelming in these. 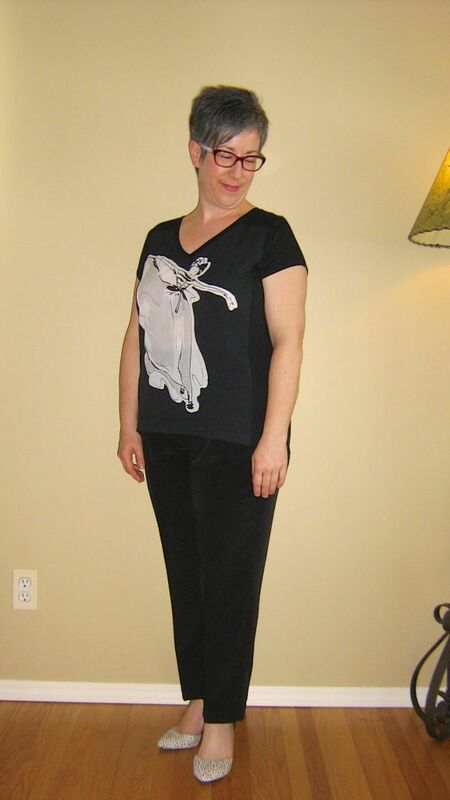 The silky trousers actually don't have a ton of volume and move beautifully when walking. The decision will be whether to shorten them to a proper cropped length or to make them proper trouser length by wearing them lower on the waist. I have checked the cuff on the bottom and it is not the type that can be let down unfortunately. 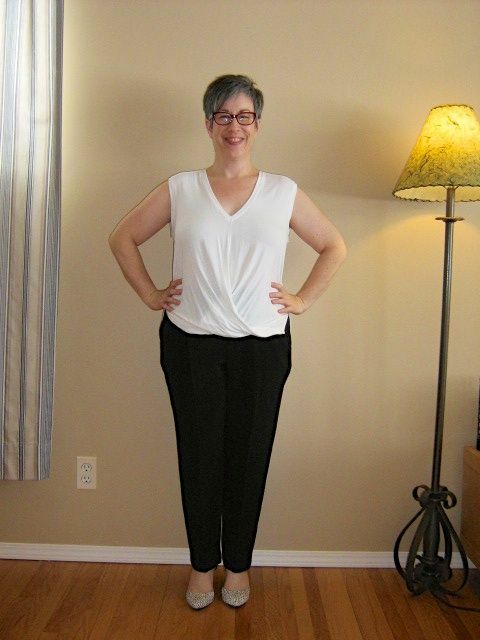 Angie if you happen to pop back into this thread, would love your thoughts on whether it would work better to make these proper ankle length trousers to wear with my kitten heels and black ankle strap heels, or wear them as full length trousers. The J Brand Aviators I am just silly in love with. It's completely irrational since they do have alot of leg volume. But I find them fairly flattering and that all important ankle taper really helps. They make me smile. I adore 10-11. Yes, I can visualize these with a flatter roll, in fact, at first (without reading your post), I thought that these had elastic in the hem. There's just something I find appealing about the cropped length, with the Okala's. I.e.,it may make sense to take them to the tailors and have them properly cropped to suit your height. Agree with Rachy that you have a most excellent selection of tee shirts! May I ask when and where you would wear these outfits? How do they fit into your lifestyle? Work or weekend? Hi Shiny - just to clarify, the trousers in pics 1-6 are the silky cropped ones (although not quite the correct cropped length for me) and are the ones I'm debating having hemmed shorter. 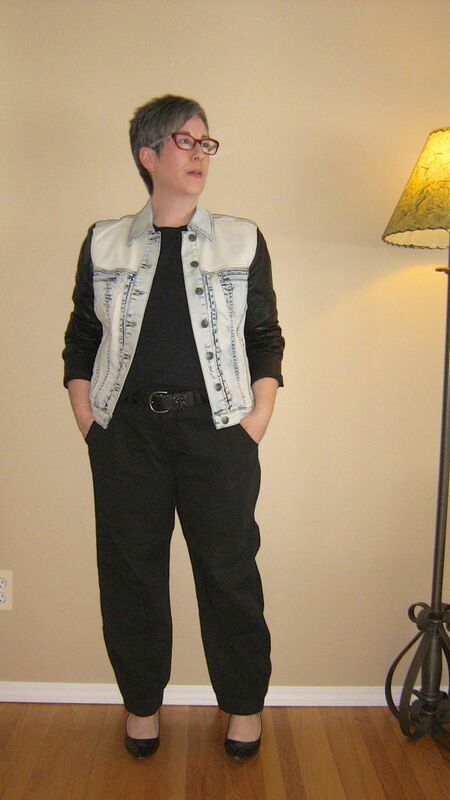 And the Aviators in pics 7 - 14 have zippers on the bottom of the trousers and elastic at the ankles. I'm not sure which trousers you are referring to getting shortened? As for where I see wearing these, the dressier pair in 1-6 can definitely be worn to work, on a date night, out for dinner with my BFF's - that sort of thing. The more casual Aviators in pics 7-14 could be worn to go to the movies, shopping, chilling on the deck with friends and even to work if dressed up with heels and a dressy top. Thanks for taking the time to think about these trousers, Shannon. I love them on you, so I'm extra happy. Lets see the track pants with black shoes as I suggested before you do any chopping. Sarah - thank you for your encoragement! Angie - you're a sweetheart for popping back in. I truly appreciate it. 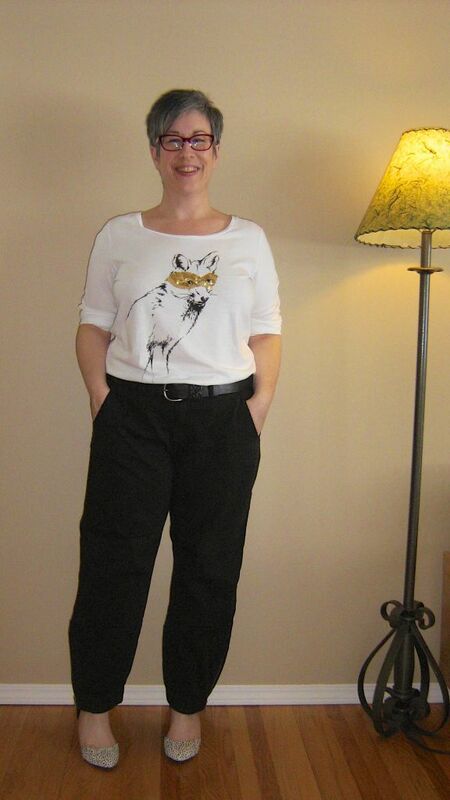 Will try the silky trousers with my black kitten heels and a wee bit lower on the waist and post pics. Hopefully that will do the trick. And thank you for suggesting I think in these purchases before making my final decision. We all know I can be a bit flighty at times and I appreciate the advice. I've tried them on again this morning (albeit with bed head!) and like them both even more so tags are off! Leopard luxe - you're so sweet! The tee in #7 is from Olsen Europe. Can you get the line in the USA? I am late here, but am so glad you have decided to keep both of these Sharon, as they are amazing on you. I really love the styling in #3 (all the other ones are amazing as well) and plan to copy it. Where did you get that fab white crossover top if I may ask? Tanya - the white cross over top was actually a Christmas present from my son. It's BCBG. It's got a hi low hem although I had to have my seamstress take 3 inches off the low hem in the back cause it was just too darned long on me. Thanks Shannon! I maanged to find it listed here in the US, altough it is currently a bit pricey for me. Hopefully it will go on sale later in the season. You have a very thoughtful son!